PTSD, Peacekeeping, and Politics by Adam Montgomery – Run For Your Life! In the twenty-first century, it seems that trauma is everywhere. From soldiers to emergency medical workers, there has been a growing awareness since the new millennium about the effects of psychological trauma on long-term mental health outcomes. We now routinely hear about post-traumatic stress disorder (PTSD) after natural disasters, car or train accidents, sexual assault, and even war journalism. But while the Western world is now keenly attuned to trauma and PTSD, each nation has had its own unique historical experience with this complex and thorny disorder. In America, the PTSD concept first grew out of the Vietnam War and the social alienation felt by returning American soldiers. Working with anti-war psychiatrists in the late 1970s, Vietnam veterans were able to gain recognition (and in some cases, compensation) for both the traumatic events they witnessed and a social ostracism which stripped them of any ability to tie their service to a nationally supported cause. PTSD was, for better or worse, as much a political disorder as a medical one in 1980s America. Stemming as it did from socio-political turmoil, PTSD was initially dismissed by other Western nations as a unique, American-specific phenomenon; that is until they, too, discovered PTSD symptoms in their own citizens. In Britain, the Falklands War and subsequent difficulties faced by British veterans spotlighted the reality of PTSD and slowly forced the British government, psychiatrists, and military brass to accept the reality of war trauma. By the late 1980s, trauma and PTSD were seen as a natural outcome of witnessing death and destruction. In Canada, a nation that had not been at war since the Korean conflict of the 1950s, PTSD was also viewed as an American-specific phenomenon throughout the 1980s. Despite ample experience with shell shock and battle exhaustion in the First and Second World War, the Canadian military quite simply forgot about trauma from the 1950s until the end of the Cold War. Then, everything changed overnight. With the fall of the Soviet Union in 1991, the United Nations and its allied countries were thrust into a plethora of peacekeeping missions; in several regions where there was little or no peace to keep. In Rwanda and the former Yugoslavia, for example, Canadian peacekeepers were faced with numerous traumatic events, such as ethnic cleansing and combat with belligerent forces. Unfortunately, they returned to a Canada that cared little for their service. Caught up in a series of scandals such as the murder of a Somali teenager by Canadian paratroopers in Somalia in 1993, the Canadian military and Department of National Defence wished to suppress any unpalatable overseas experiences. Thus, they initially denied peacekeepers faced any post-tour issues. But by the late 1990s, with Lieutenant-General Roméo Dallaire’s public battle with PTSD following his time as Force Commander in Rwanda in 1993-94, and a growing chorus of traumatized rank-and-file peacekeepers, PTSD became a cause for national concern. The Croatia Board of Inquiry, called in 1999 to investigate the possible exposure of Canadian peacekeepers to toxins in Croatia, found quite another cause for soldiers’ suffering. After dozens of testimonies from peacekeepers, many of whom told tales about cleaning up dead bodies, watching belligerents’ bodies being dragged through the streets, and having guns pointed at their heads by Croat and Serb soldiers, the board concluded that soldiers’ trauma and subsequent health difficulties were caused not by toxins, but intense psychological duress. Canadians at first demurred. Peacekeeping had become Canada’s defining contribution to global politics in the 1950 to 1980s period; it was viewed as a relatively benign and adventurous experience for Canadian soldiers. How could ostensibly peaceful tours cause the same after-effects as war? By questioning peacekeeping, Canadians had to turn inward and question their own national identity. Naturally, this introspection took time, and to some degree the peacekeeping myth – a belief that peacekeeping involves simply patrolling a well-defined zone of separation between belligerents and handing out candy to local children – endures. What has changed, though, is Canadians’ understanding that a percentage of soldiers exposed to traumatic events, whether on peacekeeping or war operations, will return with long-term mental health challenges – the most obvious being PTSD. My book, The Invisible Injured, explores all of the aforementioned themes and events, and argues that PTSD and its antecedents should be viewed not just as medical conditions, but also as profoundly shattering social experiences which are intimately linked to politics as well as Canada’s need to define itself as a middle power in world events. PTSD’s effects include not just nightmares and flashbacks; they also include possible release from the military, pension battles, and social ostracism. In the post-Afghanistan era, when the Canadian government is making plans to once again commit Canadian soldiers to peacekeeping missions in Africa, history can once again play a role in demonstrating not just where we have come from, but where we are going. 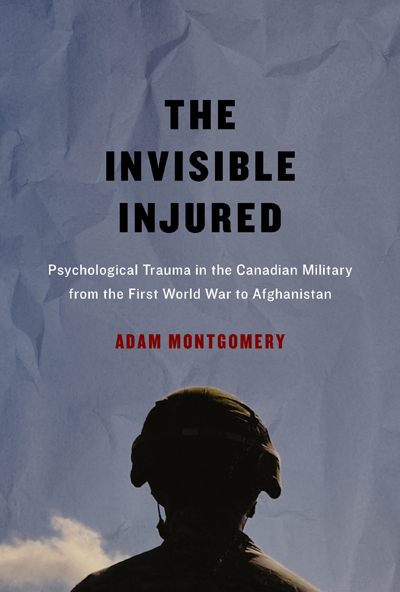 Adam Montgomery is the author of the forthcoming The Invisible Injured: Psychological Trauma in the Canadian Military from the First World War to Afghanistan (McGill-Queen’s University Press, 2017).